Notes: Local building codes dictate the minimum clearance that combustible (wood mantels) may be from the fireplace opening. 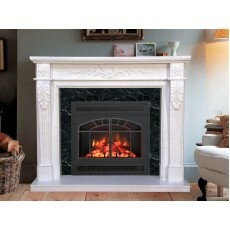 Generally clearances are a minimum of 6” on either side and as much as 12” on top for open wood burning fireplaces. 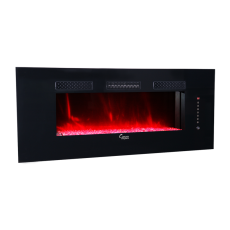 Each model of gas fireplace is different and different manufactures have their own set of clearances - this will be listed in your gas unit's installation manual. 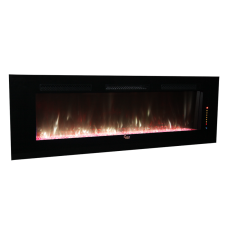 We can also help you determine required clearances if you call us with the make and model of fireplace or insert. 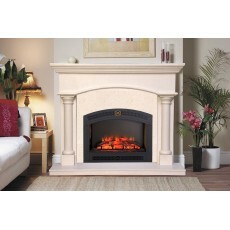 Our mantels are designed to slightly overlap the facing material on the sides and top by a minimum of ½”. They are quite simple to install. 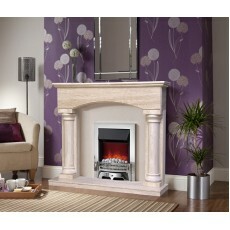 Place your order, we will confirm the measurements of your mantel and discuss any special considerations with you. 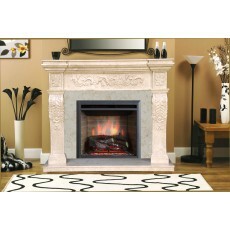 For your convenience, please view our FAQ page as well for mantel information. Note: the measurements that you are providing are critical in ensuring a correctly sized mantelpiece and care should be taken. Hazelmere Fireplace & Mantel cannot be responsible for incorrect measurements. 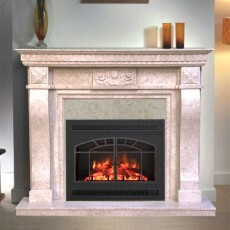 Follow these instructions to measure your fireplace for a new fireplace mantels. 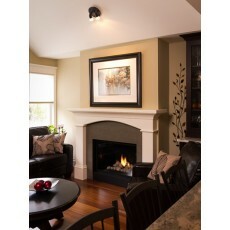 The measurement guidelines below are listed assuming you have a fireplace facing and a hearth. If you do not have a fireplace facing (decorative material like tile or brick that surrounds the fireplace opening), skip those measurements while measuring for your wood fireplace mantel. If you do not have a hearth (raised decorative surface on the floor beneath the fireplace opening), you may also skip those measurements while measuring for your fireplace surround. Total Facing Height A: Measure the total height of the fireplace facing from top to the hearth, or the floor of the room if you have no hearth. 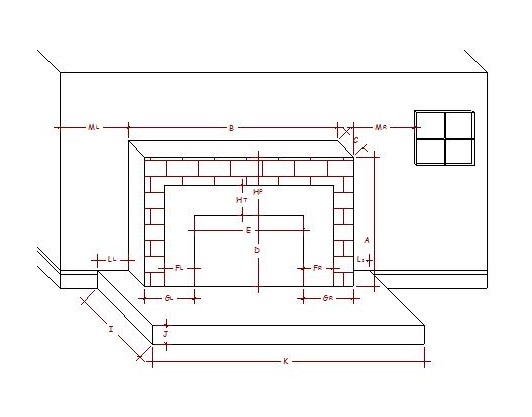 Total Facing Width B: Measure the total width of the fireplace facing from side to side. Facing Depth C: If the facing projects out from the wall, measure the distances on all four corners from the facing edge to the wall. Measure the thickness of tile, if it isn’t included in 'C'. Firebox Opening Height D: Measure the height of the opening from the floor of the fireplace. Firebox Opening Width E: Measure the width of the fireplace opening. Facing Width FL & FR: Measure the width of the tile or facing material on the left side (FL ) and right side (FR ). Facing Height Above the Opening HF: Measure the height of the brick or bumpout above the opening. Tile Height Above the Opening HT: Measure the height of the tile above the opening. Hearth Depth I: Measure the depth of the hearth from the front edge to the wall. Hearth Height J: Measure the height of the hearth from the floor to the top of the surface. Hearth Width K: Measure the width of the hearth from side to side. Hearth Side Clearance LL& LR: Measure hearth clearance on the left side (LL) and right side (LR). Side Clearance ML & MR: Measure from the edge of the facing to the nearest light fixture, door, corner, or window on Left side (ML) and Right side (MR). If you are not replacing an existing wood fireplace mantel but rather installing a new fireplace surround, you will need to check your local building codes or with you local fire department to obtain the minimum distance allowed from the fireplace opening to the fireplace surround. Once you have recorded all of the measurements you will need for your wood fireplace mantel installation, there are a few other things that you should also keep in mind as you shop for fireplace mantels. Aside from making sure that you have the correct measurements for your fireplace surround installation, we suggest that you take into consideration the style, size, and atmosphere of the entire room that the wood fireplace mantel or fireplace surround is to be installed in. You want to make sure that the wood fireplace mantel compliments the rest of the room to get the dramatic impact that mantels are designed to create.